Saige Danby – user flows, journey map, user testing, digital prototype. Presley Sytsma – company goals, competitor research, user testing, paper prototype. This was a class project focused on user experience design and research. We were tasked with updating the Slack mobile application to improve usability. 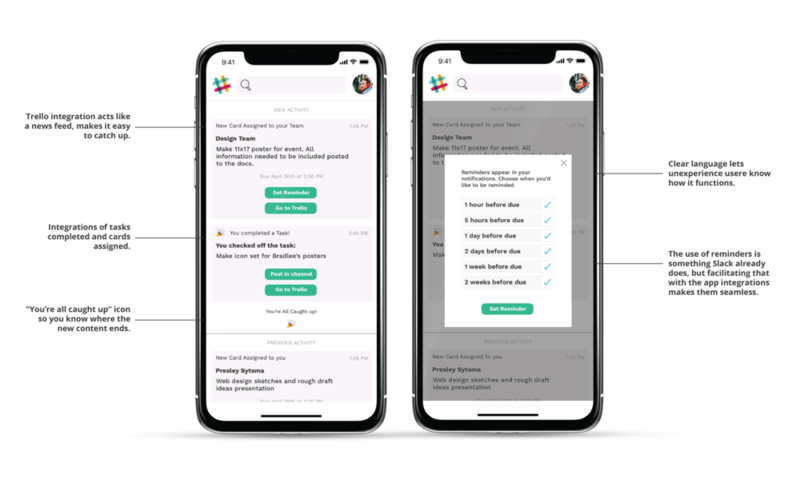 Slack brings all your work communication together in one place, is instantly searchable, and available wherever you go. At the brand level, Slack is a dose of humanity, intended to feel not like a piece software, but a team mate. Where email falls short, Slack connects people on an emotional level. With bright color usage and playful branding, as well as emoji and gif reactions, Slack feels much more personal than email. And these elements have made Slack stand out. People rave about Slack on social media. Because it so drastically departs from typical team communication methods, many report that it has greatly improved their office culture. At it's core, Slack is a product intended to make ones life easier and more productive, consolidating team communication in a customizable way. As a productivity app, this kind of positioning is necessary. It makes being professional and organized with team communication fun. With app integrations and many customizable features, it can be tailored to every team. Small businesses have noted increased productivity. And it's scalable — 77% of Fortune 100 companies use Slack as their main communication platform. 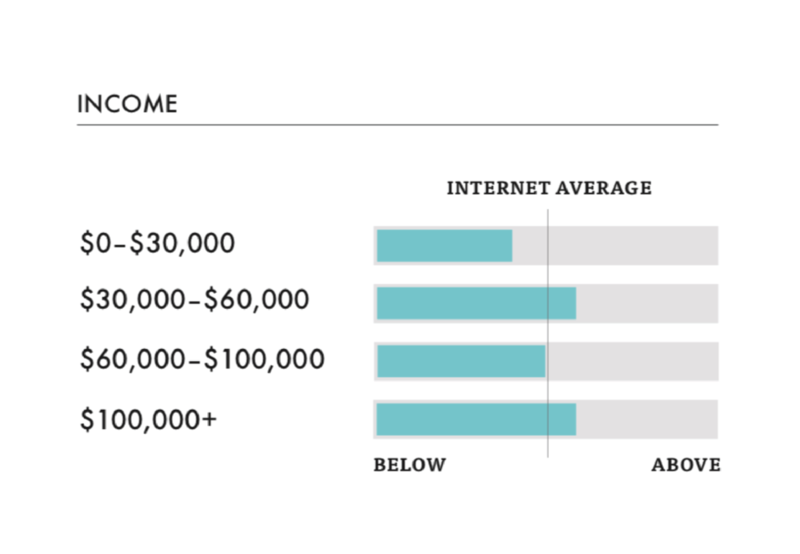 – Spike in two income brackets 2 and 4: could correlate with both small business team usage, as well as large corporation usage. 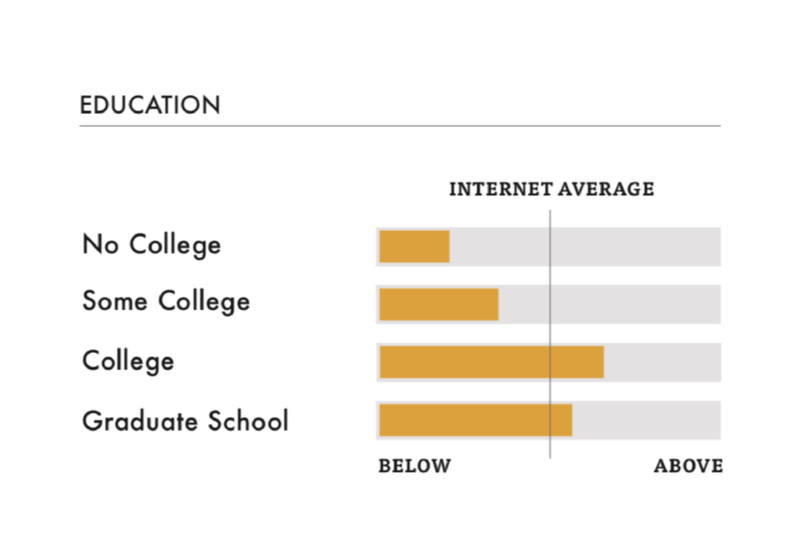 – College graduates are using Slack more commonly in the workplace than those who did not have a college degree. – 25–35 is the age group who uses it most. Tech savy, could allude to learnability issues for older age brackets. – Although the app can be accessed from everywhere, people access it mainly from work, wanting to leave their work in the office when they leave. To get more intimate with the user journey through Slack, we created a core persona to track through usage, from level of annoyance to thoughts. – Catching up: currently no way to know what highlighted channel is where your app notification came from. – Urgency: the phone app makes users feel like they have to check it all the time, but if they don't want to, they may miss an urgent message. Research pointed to frustration in catching up, so we dove into that specific user flow to see where users had trouble. We had theories on pain points, but talking to users helped us test our assumptions and find concrete problems. We surveyed 19 Slack users, ranging from students who use for group projects, to expert users who use it in professional settings. Before prototyping, we set clear goals to help us measure the success of our interfaces. 1. Clarifying the thread feature to utilize organizational structures. 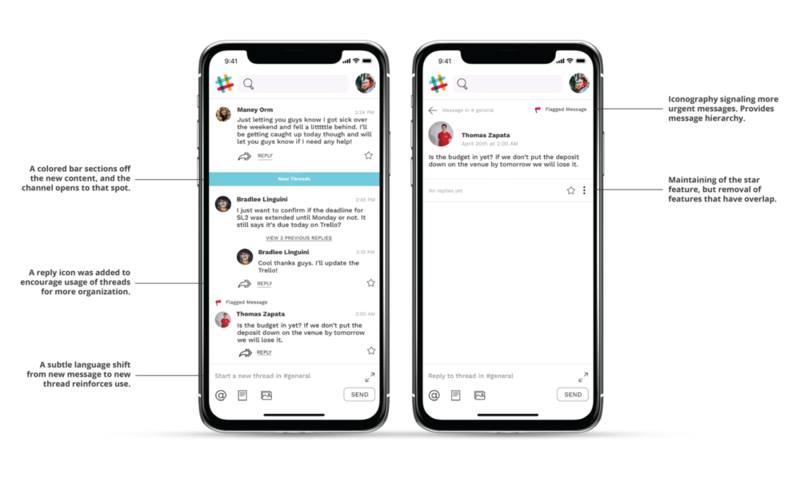 Many of our users were frustrated with the lack of organization in the messaging system, but were not aware of Slack's built-in organizational features like threads, pins, and stars. By clarifying language, using color, and renaming the new message prompt, users may be more likely to message in more structured ways, making catching up in channels easier. 2. Changing app integration experience from bot-focused to more seamless. Our small-group users did not know app integration was possible, and lacked the expertise to utilize those features. The current integration system utilized chat bots to pull in information, which wasn't what users wanted. By pulling in new features supported by Slack's most widely used app, Trello, these integrations will be more accessible to all levels of users. 3. Create a user profile that could function universally across all work spaces. One of the major pain points that stood out in our research was the changing of work spaces, not realizing they were accessible at the same time, and lack of a profile page. One user described it as "having to log into multiple facebook accounts." With one universal profile, across all work spaces, users will be able to switch workspaces easier. 4. Consolidate notifications and settings, with a universal menu bar. With notifications scattered across channels and hard to locate, a notifications tab with highly customizable settings all in one place would make catching up a breeze. A universal menu bar would allow for easy navigation and location of settings. Making notifications easier to customize will help users leave work at work, without having to worry about missing something urgent. – Our consolidated settings needed to be simplified and consolidated even further, with less options and clarified language. – The new notifications section appeared too similar to a channel, and needed to be distinguished further. – The profile and menu bar consistent across all pages was easy to navigate and deemed extremely helpful. – The new integration of Trello was intuitive even for users with no knowledge of Trello. The new Slack menu features a consistent navigation bar that stays on every page, a user curated notifications section, and all of the user's settings and workspaces in one place. 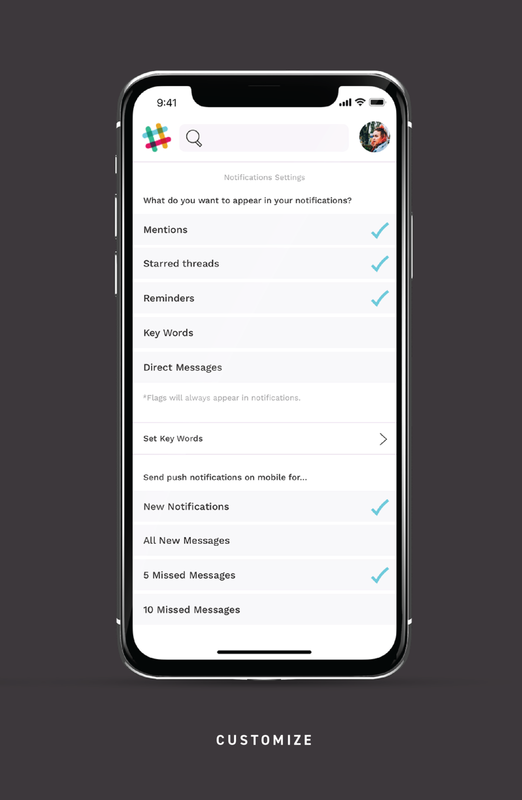 Notifications can feature mentions, starred threads, activity in starred channels, reminders, and our addition of flags, a feature that cannot be muted for urgent messages. As the user scrolls through, they can view the threads they missed by clicking a button. A celebratory "all caught up" appears at the bottom. Old notifications would appear below. Customizing notifications is now all in one place, easy to find, simple to do. You can also set key words to make sure important things are never missed. Sometimes, even small changes like icons, language, and color can bring big impacts to users. Other areas needed to be restructured almost entirely to become more usable for users at every level of expertise.